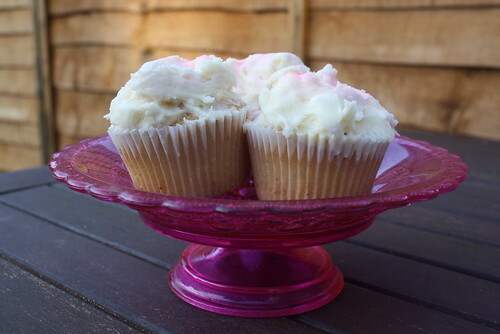 I made these marshmallow cupcakes from The Hummingbird Bakery cookbook this weekend. They are lovely, especially the dollop of marshmallow in the middle. Quite sticky, and time consuming but worth it! 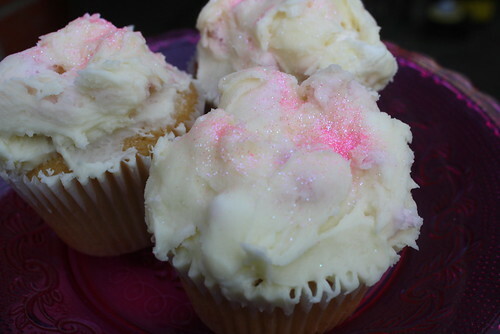 You'll get a pure sugar rush from these. Also I don't know what I am doing wrong but I doubled this recipe so that it would make 24, used standard sized cases and it still only made 12 when I'd doubled it. Any hints on this one readers? This always happens to me! 200g mini marshmallows (I used medium marshmallow cut up and rolled in icing sugar to stop them sticking together). Makes 12 (says the recipe, I doubled this to get 12). Settle an argument, do pink marshmallows taste different to white marshmallows? I say yes but my sister disagrees! Well, they both taste great either way. Omg, these look so good! The melted marshmallow in this recipes resulted in a LOT of frustration for me, but man are they tasty. And yes, pink are nicer. Are you using muffin cases? I know the hummingbird bakery recommends lakeland's muffin cases but I always find they are way too big and only make about 9 out of a standard 12 cupcake mixture. 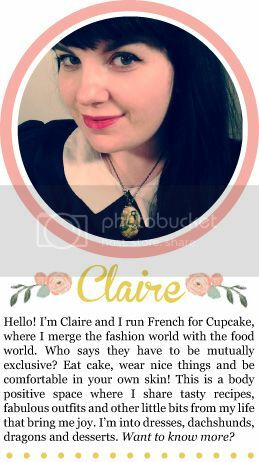 I like squires kitchen cupcake cases, they are the perfect size for the recipes I think. I usually just put about 1-2 tablespoons of mixture in - it doesn't even seem like half full but the mixture always rises really well. These look amazing, I love the sparkles! I actually got that book for christmas - must try these! 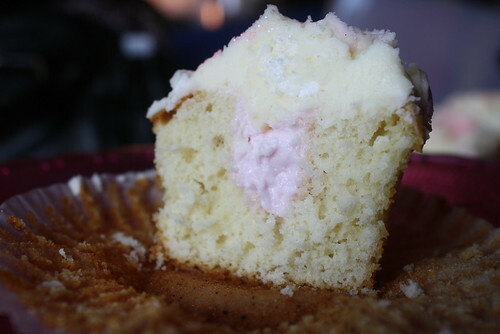 Would love to have this recipe on my cupcake forum! 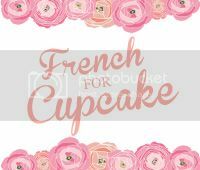 I have opened a cupcake forum, and it's so quiet, i need lovely people like you to help me liven it up a bit? Pink marshmallows are definitely nicer! These look amazing...I'm not sure mine would turn out quite as pretty, ha! White marshmallows are a million times nicer than pink ones! Ack, the marshmallow is a nightmare to get into the cavity isn't it?! But I agree, well worth the effort!